Dollar store crafts are always tons of fun to create! 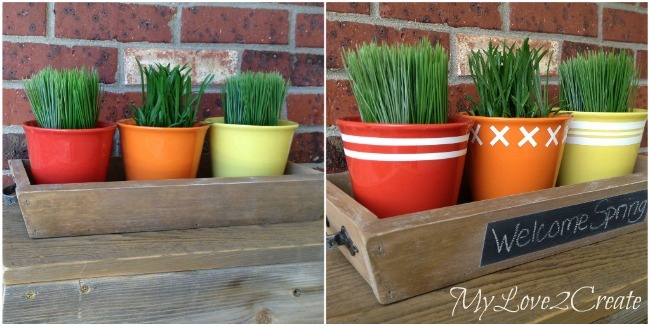 These two simple crafts are fun, easy and an inexpensive way to dress up your decor! Hello, Everyone! 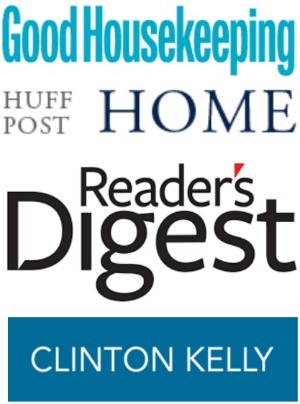 This was a super fun project and I am excited to share it today! 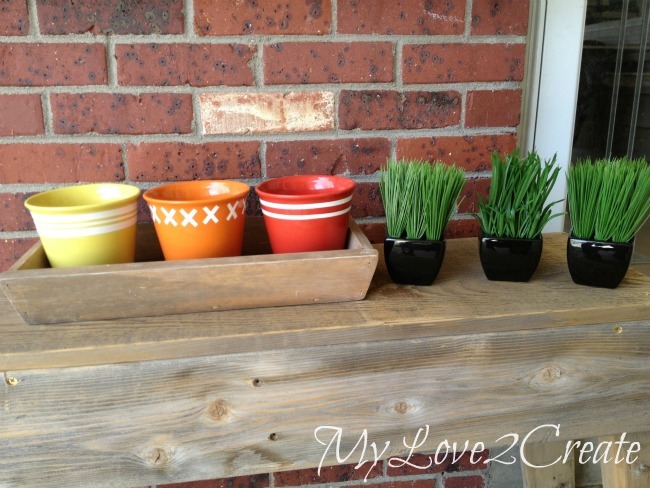 A DIY Tapered Tray and Dollar Store Pots dressed up with contact paper! I found these adorable pots at the dollar store last week and had to do something with them. 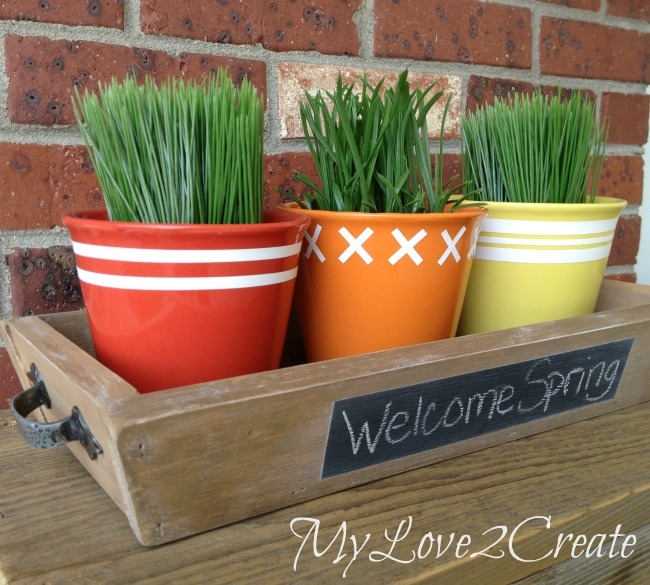 I love dollar store crafts and the bright spring colors were calling to me, so I spent $3 and brought them home. I even had some fun grass stuff to put inside. I thought I was good to go, but they needed something…some type of holder… a Tray!! 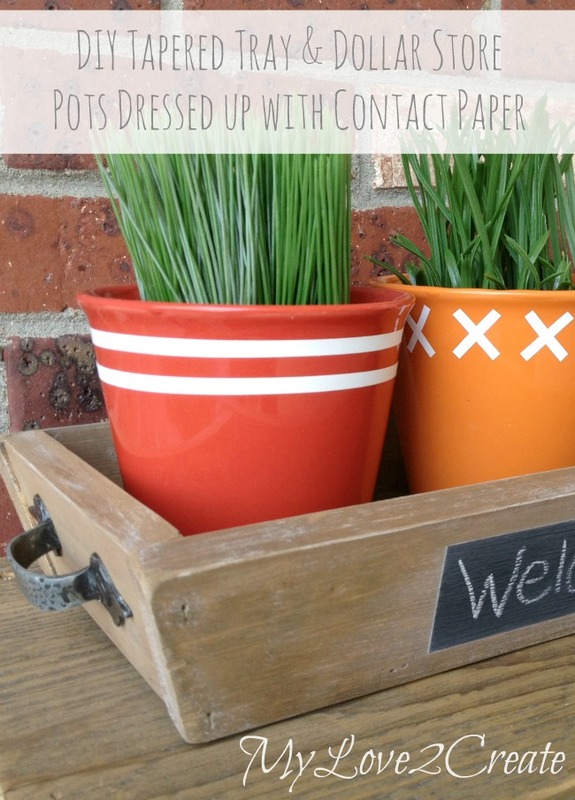 To get started on both the DIY Tapered tray and the upcycled pots using contact paper, you’ll need a few supplies. I promptly took them to the shed and set to work. I have TONS of scraps left over from my Master Closet Makeover, so I knew I could come up with something. I found some leftover 1×3’s and a scrap piece of plywood. I cut the ends 15 degrees off square (not parallel) and a rectangular bottom. 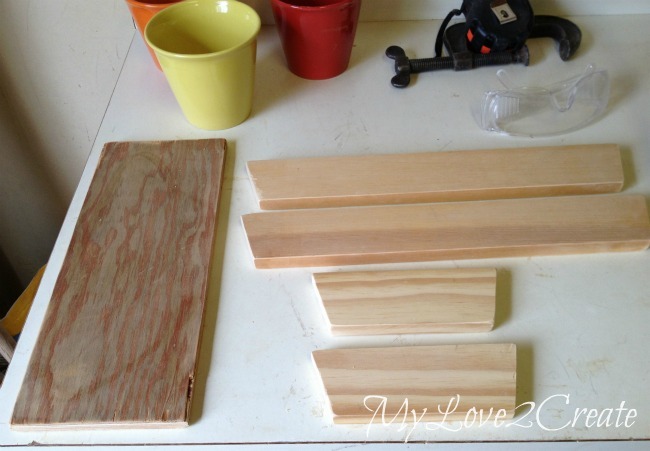 Once the pieces were cut and sanded I started building my fun new dollar store crafts! 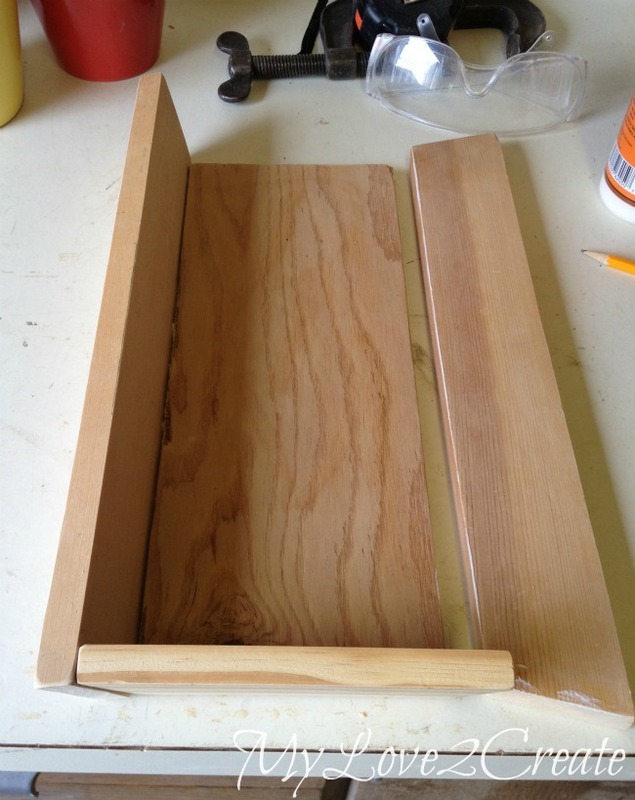 Since I was making the bottom inset, I used it as a guide and glued and nailed all the boards around in a circle. There is no set measurement for this to give you as a guide since the pots you find may not be identical in size to the ones I purchased. The best thing about dollar store crafts is how adaptable they are. 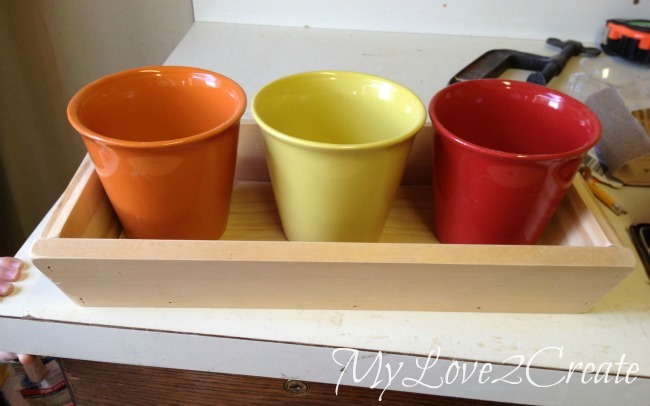 Simple measure to make sure your pots will fit into the tray easily with a bit of room to spare on each side. I also made sure to nail the bottom as well (see top left photo). When done, I was left with a cute little tray! 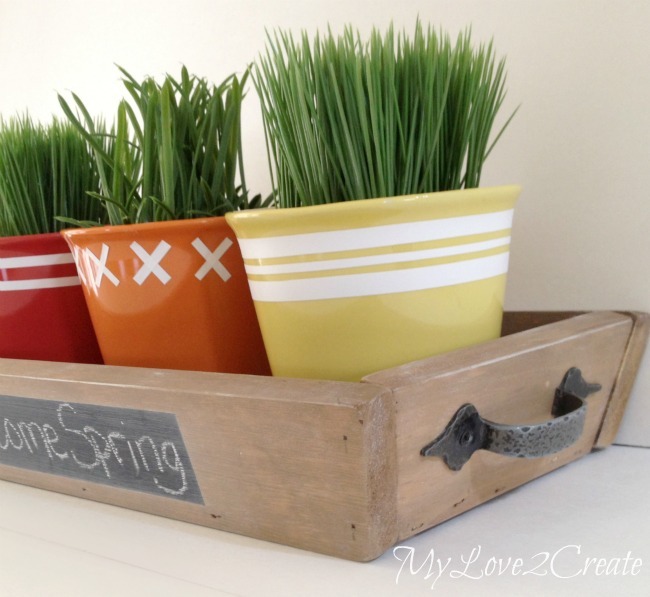 If you want a bit more in depth tutorial you can check out my Long Tapered Crate, even though I made it a little differently, it is basically the same build as this addition to our dollar store craft using ceramic pots and contact paper. I kept the pots handy throughout the build to make sure they would fit perfect. I really wanted the old wood look so I got out my Vinegar and Steel wool “stain” and slapped some on. It instantly darkens the wood. I also used this on my Camping Crate. Once it was dry I dry brushed on some white paint, and quickly wiped it off with a wet paper towel. This also gave it an old rustic feel. 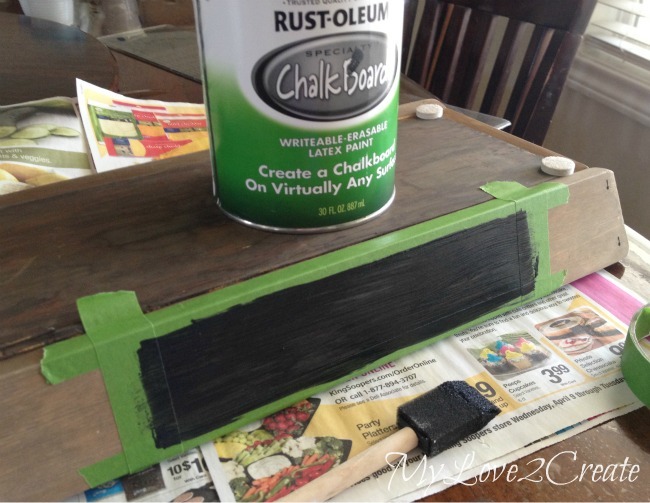 I busted out the tape and chalkboard paint, and quickly slapped on 3 coats. It dries pretty fast! To make the pots super fun and cute I grabbed some scrap white contact paper. 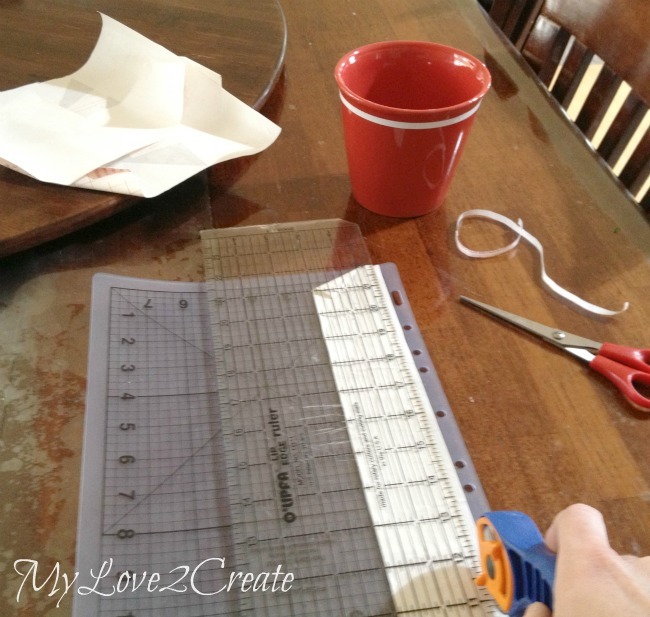 (I always have tons of of scraps because I like to use contact paper to cut stencils.) I used my rolling paper cutter and mat (because my other paper cutter is broken) and cut some strips and simply put them on the pot. 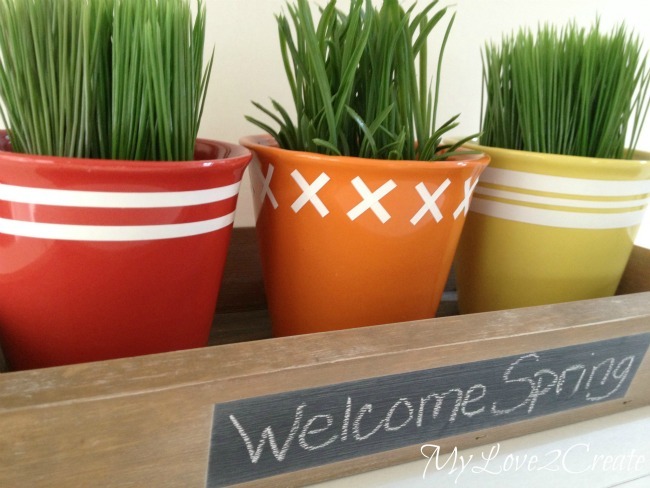 You can create any design you want using a stencil or freehand for this ceramic pots dollar store crafts idea. This scrap piece got cut into tiny strips. Then each strip got cut in half to make an X. It was super easy and fast! And this contact paper is removable, so I can take it off if I want! Here they are all done, and just so you can see how much better the grass looks in their new bright pots…here is a shot of them on their own. I also am showing you the back of the tray, I didn’t put a chalkboard label on it so if I just want a rustic tray I can turn it around! This is totally telling me “I am super cute” now! I love how much personality the contact paper gave the pots. The handles are perfect and the chalkboard label really helps the tray stand out. 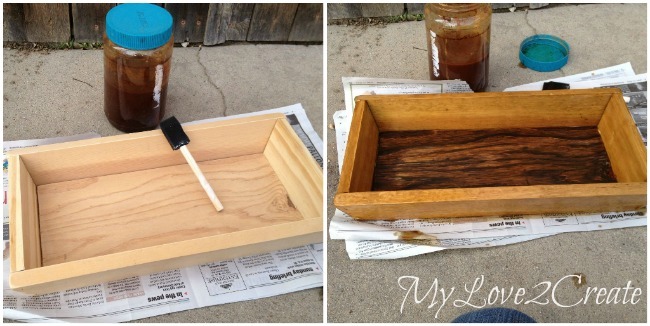 I was thinking this would be a cute tray for mail, and of course, you could write that on the side! It really could be used for anything. It was so fun to do this project! I hope I have inspired you to do your own! 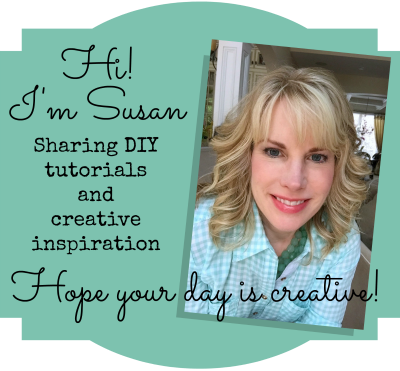 If you are interested in other fun projects please check out my blog, MyLove2Create, I would love to have you come and follow along! 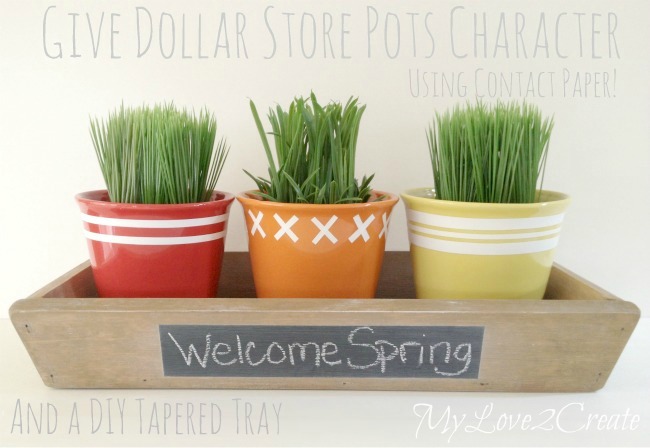 If you liked this super fun dollar store crafts project, check out some of our other easy inexpensive craft ideas! This is such a cute idea! I especially love the handles you added to the sides! Hey Girl! 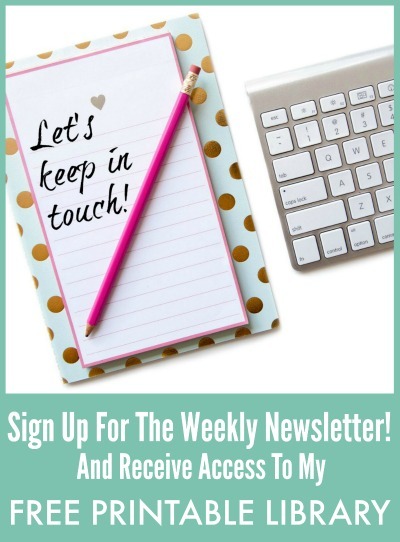 It’s Deonna from the Child at Heart blog. I was just stopping by to say hello! I’m pinning this for later. 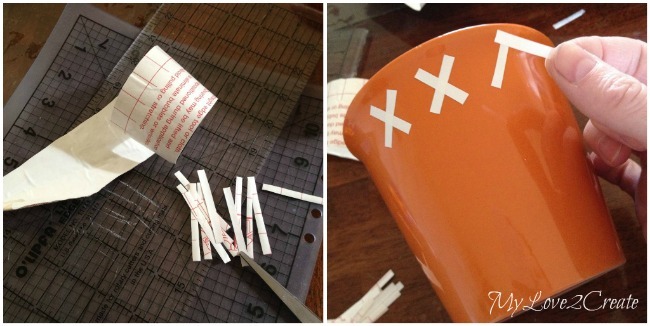 I love fixing up Dollar Store items…the contact paper is genius! I am doing a great spring necklace giveaway and would love for you to come by and enter to win 🙂 Have a joyful week!